Which iPad App to Use? Using electronic applications “apps” on an iPad can be a great solution for a student who needs additional support in their educational journey. Educational apps can provide an ideal transition from school to home, promoting greater learning. However, searching and trying to find an app that will be the right one or beneficial to the student can be an extensive research process. iPad apps are like snowflakes; no two are exactly alike. To help sort through the hundred of thousands of apps available to students, Mark Coppin, previous Director of Assistive Technology at the Anne Carlsen Center in Jamestown, ND, has developed several App Wheels to help find the app selection to fit the student’s desired outcome. The Wheel is divided into relevant topic areas. To begin selection on these App Wheels, one starts in the inner ring identifying the characteristic moving outward to the correct category of need. 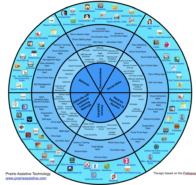 The outer ring then suggests a sampling of apps appropriate for the student’s activities. The icons on the Wheel (PDF version) are linked so you can go direct to the download or information page for each app. This makes the process that much easier. 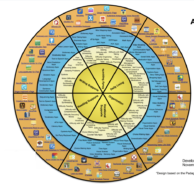 Mark’s App Wheel format was based on the Pedology Wheel, designed by Allan Carrington and modified by Cherie Pickering. The only thing missing from these Wheel Apps are the top 3 questions I always get from individuals after demonstrating any app on the iPad: how much is the app, is it available for Android or Apple users, and what is the age range that this app is intended for. Of course, all this information is available in each individual app’s summary page. I do appreciate all the time, effort, and knowledge that Mark has put behind this. 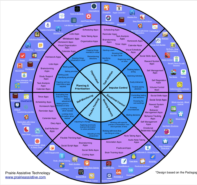 This App Wheel is an amazing tool!